Very good perspective on Flash and standards. Both the standards community and the Flash community are extremely good at sharing knowledge and supporting the people within their respective groups. The relationship across communities, however, isn’t nearly as cordial. Two things are happening: either the people within each camp stay to themselves, or one ignorantly hurls insults at the other. I love that angle. Both camps have very passionate communities but the problem is that there’s not enough cross-pollination between groups. Part of that is that (I don’t think) Flash has done a good job of playing well with HTML. It has been and still is largely a black box. So at a technical level the two technologies don’t work as well as they should have. That carries over into the communities. As a company that makes tools for both HTML and Flash, it behooves us to be involved in both sides of the debate. My hope is that as Flash opens up more and hopefully works better with HTML, the people on both sides will start to work more closely as well. 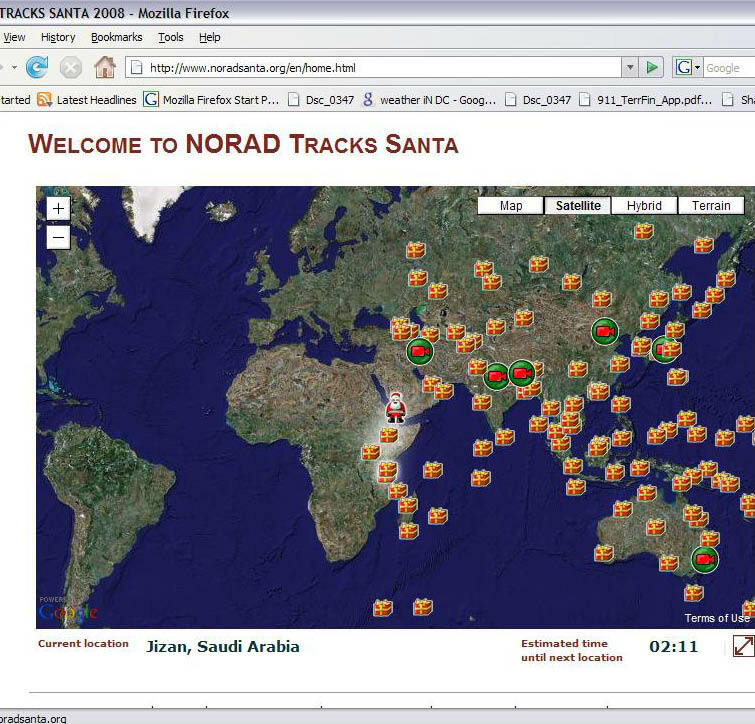 My 20% at Google is the NORAD Santa Tracker, which gazillions of adults and kiddies use each year to track the progress of Santa across the world. Last year, I used our Flash API to create the tracker map, primarily so that I could make a glittery comet trail of Santa’s past 7 stops. I tried it in JS with resized animated GIFs, and then decided that Flash would be much less painful – and was right. The code drew a line on a Sprite, blurred the line, then added some little sparkle movies and animated them. This year, I have ported the map to our JS v3 API, because we are doing aversion that utilizes the Earth plug-in (3d flying Santa! ), and I wanted to make sure there was a version that didn’t require a plug-in. But, I really miss the glittery comet trail. – Works in FF3, Chrome/Safari, IE 7+. – Doesn’t require images (bandwidth is an issue). I’ve contemplated canvas, but not sure if that supports foreground blurring,and don’t know if it would translate to VML with excanvas. It doesn’t seem very SVG-y. I could try animated GIFs again, but they don’t animate the same across browsers. I could also try window.setTimeout with some PNGs, but that will slow down the browser, require images, and won’t achieve the same blurred line effect. Do any of you have a better idea? (Help prove to me and the kiddies that Open Web can make magic happen! SVG Web does support the blur filter so you could get this working cross browser if you force the flash renderer. If you just forced the flash renderer for IE, that doesn’t solve the problem of Chrome/Safari who have not turned on their SVG Filter support. SVG Web is a cool project to support SVG, but a requirement is that you have to use Flash. So even when you try to use open standards, you still have to fall back to Flash in some cases. A hack would be to have a separate <canvas> that draws the blur w/ an opacity and z it? Seems like a decent solution, but requires some hacks. This is fine for a 20% project, but when you’re trying to be productive, are hacky solutions the best way to go? How ’bouts IE 7+ with GCF? That’d let you try things like <canvas> more directly. A perfectly fine way to do it, but GCF is the Google Chrome Frame plug-in, which would mean another plugin and as Pamela says the message after that, it’s not ideal at all from an end-user case. Now I understand that the major roadblock here is the IE 7 requirement. If it wasn’t for that you wouldn’t need the Flash fallback for SVG Web and you wouldn’t need to use something like the Chrome Frame plug-in to make it work. But that’s kind of the point of open standards. Before you can really take advantage of a technology you need to get a consensus from everyone. All of the browser vendors have different agendas and different priorities. Right now Microsoft is the hold-out, but what happens if something comes along and threatens another browser vendor’s goals? Then they’ll be the hold out. That’s part of the price you pay for standards; you have to get everyone on the same page before you can move forward. In the end, that’s better for everyone. Once everyone gets moving in the same direction, that becomes the baseline, and the web is a better place. We’re seeing that start to happen with HTML5. And despite the “Flash is dead” rhetoric, HTML5 will be a good thing for the web. Things like playing basic video and doing animation/vector graphics are so simple and yet so integral to the web experience that they should have been done in an open standards way a long time ago. But if Flash didn’t exist those things wouldn’t have become as important as they did as quickly as they did. And even now, as the web tries to move forward, Flash is being used as the fallback so that the web can evolve even if not everyone in the group buys in. To me, that says that Flash will always have value. We control the platform so we can keep innovating and pushing the web forward in our own way. Maybe that’s content protected video, maybe it’s P2P support, maybe it’s a binary transfer protocol, maybe it’s hardware acceleration, maybe it’s writing your own filters and blend modes, and maybe it’s real-time collaboration. Eventually, the open web will incorporate all of those things. But I still wish there was more cooperation between the companies who have technology core to the web and the open standards groups who create the future of the open web. If nothing else, the open standards organizations can see what features stick and which don’t so that you don’t waste valuable time trying to standardize something users don’t want. In the end, everyone wins. Flash won’t die, Flash developers can still be on the cutting edge, and Adobe will continue to support designers and developers on both sides of the open web/Flash spectrum. We’re all part of the web ecosystem in our own ways. Just like any ecological system, if one side goes extinct, the other is going to suffer.